This is a book about death, loss, grief and mourning, but with an unusual twist. It is different in that it explores specific kinds of deaths encountered within families and households, rather than general concepts of mourning. It is even more unusual because here six psychoanalysts reveal how they have suffered, processed, and survived losses in their own lives; at the same time bringing clinical and theoretical perspectives of various psychoanalytic schools to bear on their own, as well as others’, experiences. The narratives in this book use the power of subjective experience, as described by psychoanalysts themselves, to understand, contextualize, and extend existing clinical approaches. Each chapter addresses the death of a different loved one. The losses discussed include death of a mother, death of a father, death of a sibling, death of a spouse, death of a child, and death of a pet (recognizing the deep significance of pets in human households). These accounts are bookended by a chapter reviewing the spectrum of emotional reactions to death and current ideas of grief and mourning, and a chapter weaving together the many narratives as well as exploring some additional situations and ideas. 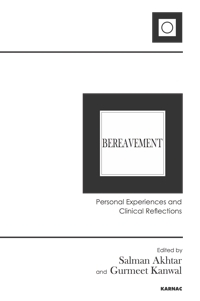 "Salman Akhtar and Gurmeet S. Kanwal offer us a superbly edited volume on bereavement. Its contributors share with the reader their intimate, painful, and profound experiences as they mourn the death of a child, parent, sibling, spouse, or pet. Together, they offer us many new insights, including that 'libido' is never completely detached from any relationship. Mental health professionals and lay people alike will benefit from this deep exploration of the timeless and universal experience of mourning." "Reading this book, I felt accompanied in my own grief. The contributors, all exceptionally thoughtful and scholarly clinicians, illuminate their various losses with selected theoretical constructs, combined with uncommon clarity and emotional generosity. Their heartfelt language invites the reader into an intimate conversation that is moving, unforgettable, and ultimately sustaining. A must-read for those engaged in the 'helping' professions and anyone wanting to better understand the role loss plays in our lives." Salman Akhtar MD was born in India and completed his medical and psychiatric education there. Upon arriving in the USA in 1973, he repeated his psychiatric training at the University of Virginia School of Medicine, and then obtained psychoanalytic training from the Philadelphia Psychoanalytic Institute. Currently, he is Professor of Psychiatry at Jefferson Medical College and a training and supervising analyst at the Psychoanalytic Center of Philadelphia. He has authored, edited or co-edited more than 300 publications including books on psychiatry and psychoanalysis and several collections of poetry. He is also a Scholar-in-Residence at the InterAct Theatre Company in Philadelphia. Salman Akhtar received the Sigourney Award in 2012. Gurmeet Kanwal MD is Clinical Associate Professor of Psychiatry at the Weill Medical College of Cornell University, New York, where he teaches and supervises residents at the Payne Whitney Psychiatric Clinic. He is Supervising Psychoanalyst and Teaching Faculty at the William Alanson White Institute of Psychiatry, Psychology and Psychoanalysis, and Past-President of the William Alanson White Psychoanalytic Society. He is on the Editorial Boards of the International Journal of Psychoanalysis and Psychoanalytic Discourse. His recent papers have appeared in Psychoanalytic Review and Neuropsychoanalysis. He has also blogged for the Psychoanalysis 3.0/Psychology Today website, and lectured in New Delhi, India, on interpersonal psychoanalysis. His areas of interest include culture, trauma, and the interface of neuroscience and psychoanalysis. Currently he is in full time private practice in New York City.